Image: Gunnie Moberg. 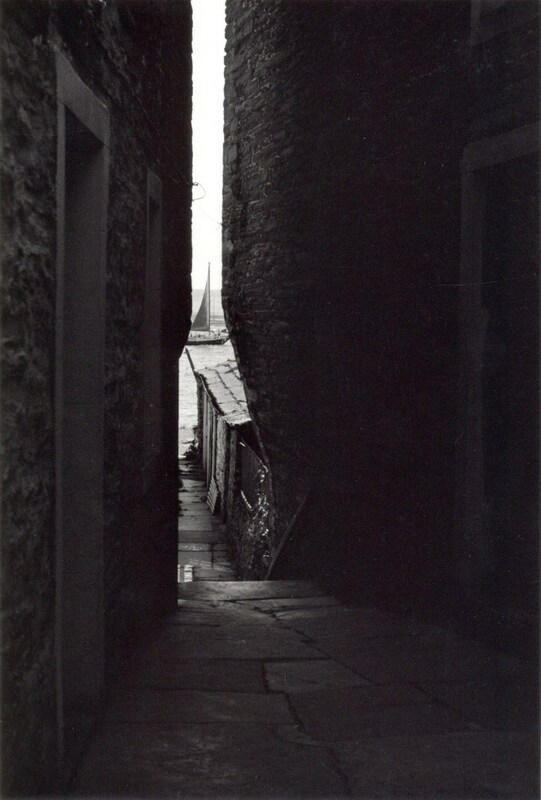 This favoured close in Stromness features in several of Gunnie’s photographs of the town. "I always tried to take pictures that were simple and clean. From the air you lose one dimension, but in the landscape you always have three and that clutters up my pictures sometimes – it’s very hard to get that clean line… It has to do with space..."
Gun (Gunnie) Margoth Moberg was a prominent Scottish photo-journalist and photographer who lived in Orkney from 1976 until her death on the 31st October 2007. Shortly after Gunnie moved to Orkney she took a job with Loganair, whose pilots were often willing to take her for a flight around the islands when they had a seat free. She took many extraordinary photographs from the air, some of which can be seen in her book 'Stone Built' of 1979, a facsimile of which has been published by The Orcadian this year. Her photojournalism career began almost by accident when an American plane, a Tomcat, crashed into the sea nearby, and she was able to persuade a pilot to take her to view and photograph the wreckage. These photographs sold to the National papers for a substantial sum, and she became their source for news photographs in the far islands of Orkney, Shetland and the Faroes. Gunnie was also Photographer in Residence of the St Magnus Festival in Orkney from its inception in '77 almost until the end of her life, photographing literary and musical celebrities and the life of the festival. She collaborated on travel guides to Orkney and also contributed to the books of poet George Mackay Brown, who in turn wrote a series of poems as captions for her book 'Stone', a series of superb abstract sudies of Orkney stones. For almost 30 years Gunnie walked the Orkney islands in all weathers, with her dogs and her Olympus OM1, taking some of the most spectacular landscape and nature photographs there are, in some of the most spectacular locations in the UK. In later life Gunnie became an almost obsessive gardener, and naturally her photography reflected this. She took many photographs of her garden and flowers, including some exraordinary, softly woven double exposures which she planned meticulously, and which look like floral textiles. We would like to thank Rebecca Marr at the Gunnie Moberg Archive for her helpful links advice. The archive is a treasure trove of Gunnie links, and it can be found here.